without which redemption is impossible. The above quote was Rizal's response to the question about why he felt Filipinos are not ready for independence. The wisdom expressed in this quote was based on his life-long study of history, other cultures, nations and the Filipino people. No other Filipino better understood the Filipino psyche. As we approach the new millennium and take stock of who we Filipinos really are, we might ask ourselves, "What might Rizal say about us now?" But why should we care what Rizal might say about us? Why? Because Rizal gave us so much. His life's work was devoted to the emancipation (read "redemption") of the Filipino people. 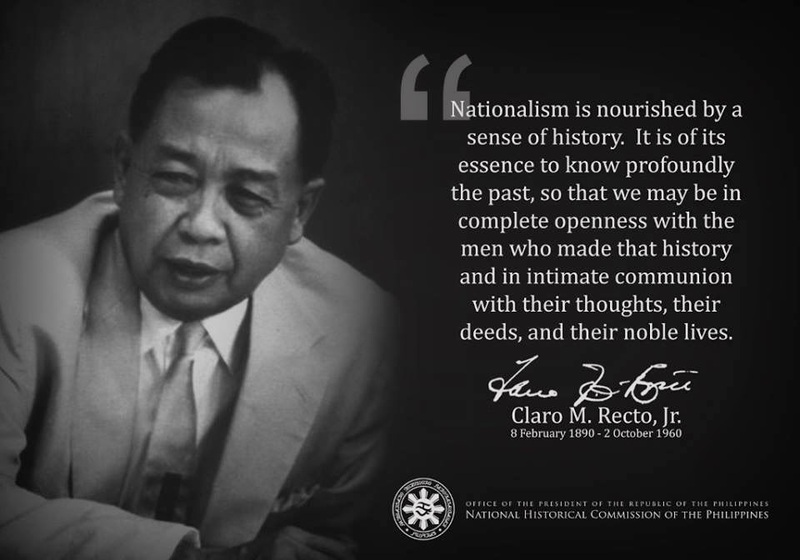 His appraisal of Filipinos' ill-preparedness for independence was based on his intimate knowledge of who we were then. In his time, we didn't view the Philippines as a nation; we were merely a province of Spain. We didn't have a language, we had many languages. When the Spaniards told the Kapampangans that the Cavitenos are bandits and not to be trusted, we believed it, not knowing they were telling the Cavitenos the same things about the Kapampangans. We believed all the Spanish lies about ourselves. Sadly, some of those lies continue to influence us to this day. Why? Because Rizal knew how brainwashed we were. He said no, we are one nation, one race regardless of whether we are Bikolanos, Chinese, Igorote or Negritos, rich or poor, educated or non-educated, haves or have-nots. We are Filipinos. He was the first to call us by the name, "Filipino" when the Spaniards were calling us "Indios." He said, "my lips have forgotten the names of the native races in the Philippines in order not to say more than Filipinos." Why? Because he wrote our first Tagalog grammar book. He said, "...to what purpose is teaching Spanish but to add another to the 40 or so we already have." Back then he didn't know there were actually 75 languages or so spoken. Why? Because he spoke for us. He knew the Spaniards made us feel inferior because we were passive, afraid for our lives, lacked assertiveness and placed a high premium on silence and soft-speaking. He tried to bolster our ego by giving us an identity -- by teaching us about our tradition and our history. In his studies he discovered that before the Spaniards came we had technology, trade, businesses, arts and we were inventors. We knew how to govern ourselves. Rizal knew all about our inherent, latent and inherited talents. Knowing that intelligence does not equate with color, he concluded that opportunity is what we lack. Why? Because he gave us himself as a model. "I want to give an example to my people," he said, "that I write not for myself, nor for glory, but for my country." More than even this, he gave his life's blood for his loved Filipinos. He said, "We die only once ... and if one has to die, at least one must die in his own country, by his country and for his country." Why? Because Rizal's writings are replete with suggestions for our future that not only reflect the acuity of his mind, but also summon our attention. He left us his precious wisdom as tools to help us toward a successful future. So where are we today, and where are we going? In reviewing our attainments over the past 103 years since Rizal's execution, there is much to reflect upon. As a nation, we've roller-coasted our way, sometimes floundering, sometimes confidently striding forward, dependent upon the abilities of our presidents and political leaders. Overall, I believe we've done well. We've progressed in jumps and starts without causing any major wars, and we've survived our calamities. As a people, here and abroad, the list of accomplished Filipinos is long. Did you know that the person who designed the land rover left on the moon was a Filipino engineer? We are definitely accomplishing and there are many amongst us we can be proud of. But let's not get too cocky. There are some trends occurring in our communities today that are worrisome, especially those concerning our youth. As an educator at a public comprehensive university in the Southwest of 2,500 students, I find only 3 Filipino American students. Three! For a people who pride themselves on the value of education, this seems to be an anomaly. We seem to be losing our value in education. As the largest Asian American group we also have one of the largest percentages of professionals. But not for long if this alarming trend continues. "The school is the basis of society," said one of Rizal's characters in Noli Me Tangere. "Show me the school of a people, and I will show you what the people are like." A high-paying job can never take the place of a well-rounded education in the humanities, arts and sciences -- which Rizal mastered -- in the development of human potential and greatness. We must be unified in our efforts to help our youth realize their highest potential as they are our future who can continue to make us proud as a people. Yes, we've accomplished much in the past century, but there is still a long road ahead and we must be patient. As Rizal himself believed, greatness happens over the long haul. He said, "European nations are rich ... but they needed centuries of struggle, wise combinations, liberty, laws, thinkers who bequeathed to them riches." When he said this, he was envisioning our beginning. On this path to the future we must forget about all our differences because we have one common ground to work from: Rizal and his humanity. Our love for Rizal is evident by the streets and parks we name after him, and the more than two dozen books written about him. And it's no wonder: one foreign biographer called him a rare comet that only comes every so many centuries. Other nations also recognize his rarity. Recently, the Malaysian government officially raised his stature to hero of the Malay race. And many other countries have put up statues, plaques and have staged events to honor his martyrdom. Some have even called him a "global" hero and rightly so. He is a global hero because he is a champion of human rights, a lover of humanity, and a symbol of human dignity that goes beyond geographical boundaries, cultural differences, language barriers, religious as well as political structures. Schools, media and history have honored other individuals like Rizal as heros and reformers of the world, such as Jesus Christ, Buddha, Muhammad, Confucius, Gandhi, or Martin Luther King. Like Rizal, these men encountered oppression and tyranny, set out to emancipate their people, and confronted their enemies peacefully to seek change. To end this tribute to the greatest Filipino that ever lived, I'd like to leave you with these thoughts: For whatever meaning we attach to Rizal, we must acknowledge that our lives have been blessed by his love which should sustain us to become a proud and accomplished race as he had wanted us to be; we should be confident as we tread our way to future paths; and we should love ourselves and one another as he loved us. Published in the author's continuing monthly column of the Filipino American Journal, Phoenix, Arizona, U.S.A. In these articles, the author addresses and expands upon Dr. Jose Rizal's quest for the true nature of Filipino identity. She can be reached at lysander@lascruces.com. For information about the Filipino American Journal, you may contact the publishers, Leo or Melanie Aromin, at LMAROMIN@AOL.COM.